The bigger the catch, the bigger the rewards as fish are worth their weight in gold coins in the clear waters of Alaska. Cast as far as you can into the vast blue river and hold onto your rod tightly as you wait for a big fish to bite before reeling it in and scooping it up with your net to claim the catch of the day and win a big golden trophy. The Alaskan Fishing slot machine has been developed by Microgaming with the reels set underwater where you’ll be hoping to hook a large salmon plus upbeat music, which is typical of the tunes you find in fishing programmes on the television, plays as you spin the reels – just don’t turn it up too loudly or you’ll scare all the fish away! With snow-capped mountains visible in the distance you will find yourself in the heart of an Alaskan river where you can win up to 1,215,00 coins - plus there is also the Fly Fishing feature where you can win up to 15x your stake and a free spins mode where you’ll spin the reels for free 15 times and enjoy all wins being doubled. The thought of setting up for a day of fishing only to hook nothing is rather frightening, but in the Alaskan Fishing slot machine the odds of landing big catches are in your favour with a return to player percentage of 96.63% boasted. This freshwater adventure takes place across 5 reels offering 243-ways to win and you can your fees per cast range from £0.30 up to £75.00 each time. Unfortunately, the symbols in Alaskan Fishing have not been designed to the high standards we have become familiar with thanks to 3D slot machines, however the twelve symbols that do feature on the reels will certainly put you in the good for a fishing adventure! 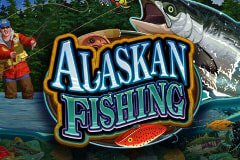 The Alaskan Fishing logo is a stacked Wild symbol in both the base game and the free spins mode, substituting for all standard symbols but not the two other special symbols, with five on a payline resulting in the largest payout of 500 coins, while four and three pay 100 and 60 respectively. The two other special symbols are a tackle box that is full of lures to entice the fish, plus a fisherman who is chuffed with his prized catch. Spinning the reels of Alaskan Fishing will also see you reel in big wins for claiming victory in the fishing competition to walk away with a 1st place golden trophy, a large salmon that springs out of the water, an assortment of tropical fish, a grizzly bear feasting on a salmon it’s just caught in the waters, an eagle that swoops down and captures a salmon for dinner, a bi-plane which can take you into the middle of the largest rivers, a fishing boat that glides downstream as you cast your rod, a reel, plus a vibrant fishing fly that you’ll hope your underwater friends get hooked on! There are designated posts to fish at all around this stunning Alaskan river and deciding which one to pitch up at and cast your rod could determine the success you’ll have – from catching small tiddly fish that you don’t even know have been hooked to those that make your rod bend as you struggle to reel them in. This Fly Fishing bonus feature is a simple pick ‘em feature which begins when you land the fisherman symbol on the first and fifth reels with you then having to select one of five posts to win a random multiplier worth 2x-15x your stake – choose carefully! Whenever you land the tackle box symbol on the reels three or more times in any position you’ll get to cast your rod for free without any fees in a very rewarding free spins mode. You’ll have 15 free spins as bait to land as many fish as you can and all wins are doubled during the feature – plus you can even win additional free spins as they play out. Alaskan Fishing is definitely a slot that will reel you in and leave you hooked! While I’m not a fan of the graphics and much prefer those in Novomatic’s Big Catch, the bonus features more than make up for this with you choosing your preferred spot to fish at for a multiplier bonus and casting your rod for free in a tranquil free spins feature!